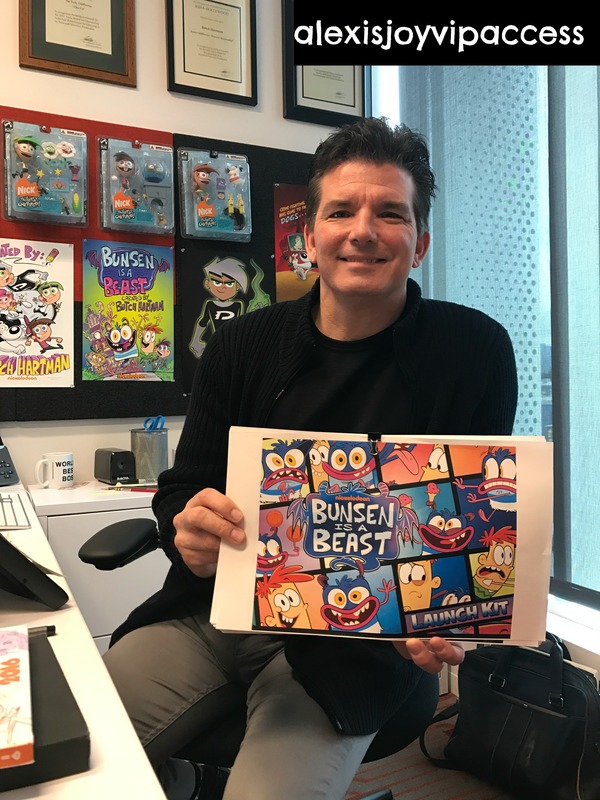 VIPAccessEXCLUSIVE: The Genius Butch Hartman Talks About His New Show “Bunsen Is A Beast” In His Interview With Alexisjoyvipaccess! Cartoons are a special part of everyone’s lives – whether it is during your childhood days of enjoying all of the fun, animated shows that aired on TV or even growing up and having certain cartoons still hold a special place in your heart. Needless to say, cartoons and animated shows have a great impact on the lives of many, and when they are done in a stupendous and phenomenal way, like the way that the genius Butch Hartman creates them, then those cartoons suddenly become more than just cartoons – it also becomes a way for people to escape into an imaginary world, have some laughs, watch some exciting moments, and make some unforgettable memories with characters they will always love. A few animated shows that stand out include The Fairly Oddparents, Danny Phantom, and T.U.F.F. Puppy. All of these outstanding shows are unique in their own way with sensational episodes, hilarious situations, and a whole lot of fun. These three iconic shows have another thing in common in addition to being a part of the amazing Nickelodeon animation family, they are also shows that were created by the immensely talented, prolific and consummate cartoon creator, the one and only, Butch Hartman. There are no amount of words to fully describe Butch Hartman’s brilliance – no amount of words suffice. Through all of his renowned, highly-acclaimed and fan-favorite projects, Butch Hartman has managed to put a smile on viewers’ faces every time an episode of one of his shows comes on. He has managed to make viewers laugh until their stomachs hurt (and then laugh even more after that). He has brought families together and has made bonds stronger as people join together to watch his shows. To put it in simple terms, Butch Hartman has and continues to make an everlasting impact on the lives of many through his creative spirit, his incredible art and passion for what he does, and his unrivaled talent. Imagine life without some of your favorite animated shows. It just wouldn’t be the same. Butch Hartman is a living legend who has been and continues to be a crucial part of the Nickelodeon family these past 18 years and counting. Now, Butch Hartman is bringing out another extraordinary show on Nickelodeon titled Bunsen is a Beast, which is bound to be everyone’s new favorite animated show and is set to premiere on February 21st. Bunsen is a Beast revolves around Bunsen, the first beast to attend human school. In this remarkable show, viewers get to see the adorable and always so happy Bunsen transition to life in a human school. Whether it’s getting through picture day or eating the school lunches, Bunsen has the help of his friend Mikey right by his side to get through all of their interesting adventures. Bunsen is a Beast is one of a kind and is a terrific show for everyone of all ages to watch. It has great humor, a lot of excitement, and a ton of excellent messages such as that it’s okay to be different and the importance of friendship. As soon as you watch Bunsen is a Beast, you will find yourself smiling from ear to ear. It’s a spectacular show and we all couldn’t be anymore grateful to the exceptional Butch Hartman for sharing his talent with us all yet again through this wonderful show. I, Alexisjoyvipaccess had the greatest, greatest honor of interviewing the phenomenal Butch Hartman at the new Nickelodeon Burbank Headquarters. Butch Hartman talked exclusively with Alexisjoyvipaccess all about the inspiration behind creating Bunsen is a Beast, what advice he would give Bunsen to help him survive his first day at school, what his favorite episode from the show is, and so much more only in our VIPAccessEXCLUSIVE interview. Butch Hartman even revealed the other show that he would like to see a cross-over episode happen with Bunsen is a Beast and he took on a fun speed round where he revealed which character he would like to swap lives with for a day and more – hear what he had to say in our VIPAccessEXCLUSIVE interview below. Thank you for the terrific interview, Butch Hartman! Check out my VIPAccessEXCLUSIVE interview with the magnificent Butch Hartman at the Nickelodeon Burbank Headquarters below! Be sure to tune in to the highly-anticipated premiere of Bunsen is a Beast on February 21st at 5:30 PM ET / PT on Nickelodeon! Follow @Nickelodeon, @NickAnimation and @BunsenIsABeast on Twitter and Instagram and join in on the social conversation by using #BunsenIsABeast! Previous Article: Breanna Yde Celebrated Valentine’s Day In The Best Way Possible – She Met Ed Sheeran!